October | 2013 | Every good thing…. Time for a boat update. We will be pulling kit off the Clew this weekend. Plans are to clean her up and get her listed for sale. Her slip lease expires Jan 1 and we hope to sell her before that time. A sad task as she is a good boat. 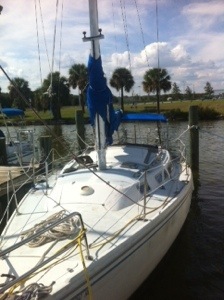 Our goals for this weekend are to get her pumped out and ready to move to Westlands next week. She will be going in the hard for the next month or so. Then the real work begins. Since the demise of the F150 we have been very busy. 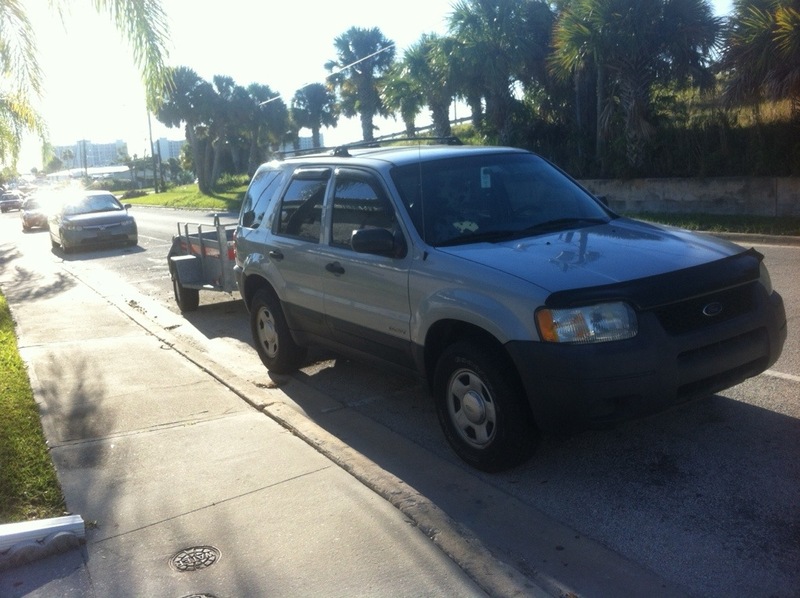 I had a hitch installed on the Escape and used it to retrieve a motor on transmission on Friday last. We now are in possession of a Hurth 2:1 reduction trans and a Westerbeke W13 marine diesel. Now all I need to do is put it all together and install it in the boat. Friday night we went out to the Bell and started cleaning and working in earnest. We discovered there is no real holding tank and have since ordered one from Catalina. In 2 to 3 weeks we will have sanitation. 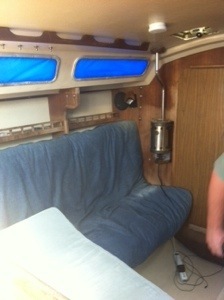 I endeavored to start on rewiring the boat. I am about 80% done at the moment. Our pressure water pump and salt water foot pump failed this weekend, I don’t think they take to working after years of neglect. New ones are on order. 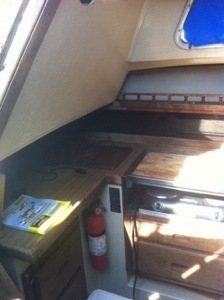 We also boarded the dinghy and did a quick look at the hull, stripping and new paint is in order. Well that’s it for now. More to come later. Grrr, been wavering back and forth about selling the truck, a 1997 F-150 Lariat. It is old and the insurance cheap so it stays in the driveway. Could have sold it for $1800 a month ago but after $400 on tires, $100 battery and $500 on a brake job in the last year balked at letting it go. Last Saturday coming back from the boat it started to miss and through a code. Looked at it today, misfire on 2&4. Pulled the plugs wires out and the wells were full of coolant. Cleaned it all up, started and ran fine, no misfire or code. Drove it to church and back and could smell coolant and the misfire returned. Time to do research. 4.6l engine was the subject of a class action suite, starting in 96 they used an all plastic intake manifold that would crack in the coolant crossover and cause plug 2&4 to foul. 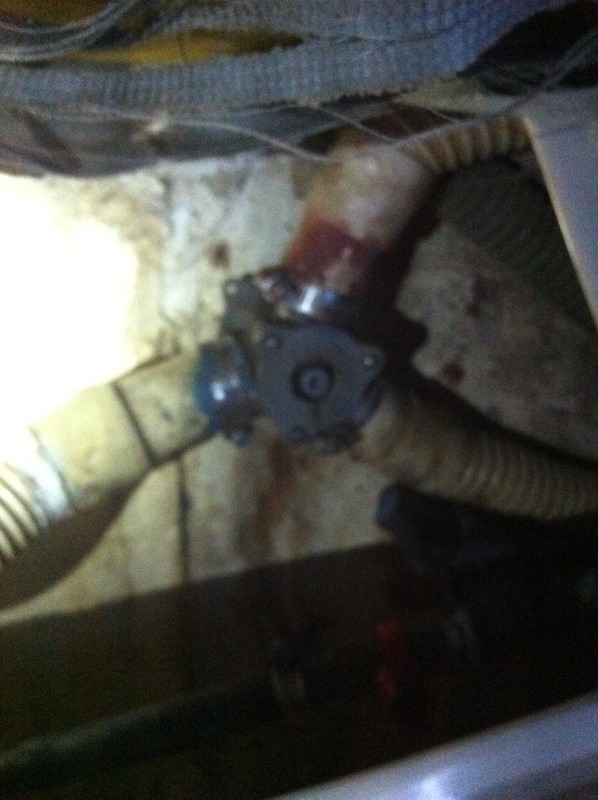 Suite is closed so now all I can do is replace the manifold. $240 for parts, add labor, looks like over $500 if I let someone else do it. Of course this comes at the worst possible time. 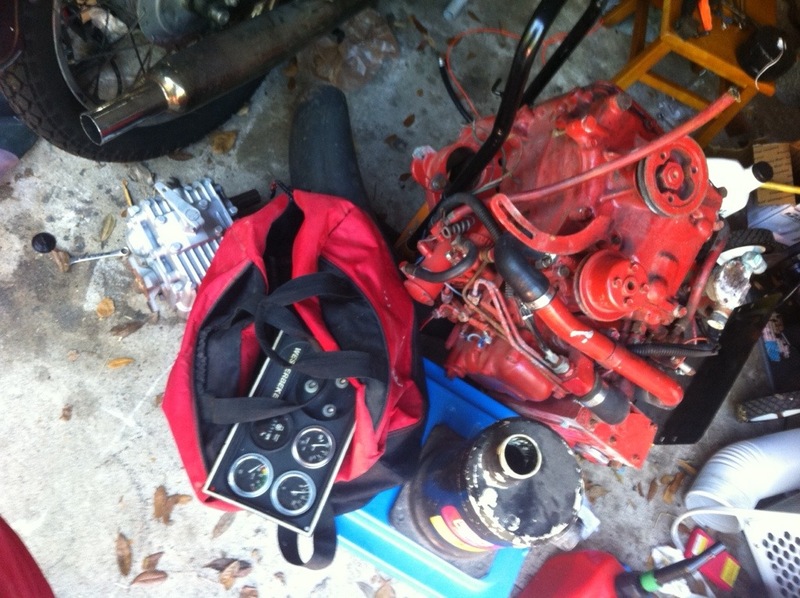 Friday I have off and am scheduled to run down to Vero and Palm Bay to pick up a motor and transmission for the boat. Now I will have to fold down the rear seat on the Escape and jam the motor up in the back of it. I could put a hitch on and rent a small trailer from Uhaul.. Hmmm.. What to do, $1000 trip is now looking like a $1500 trip and a lot more work. Been noodling things out this morning. 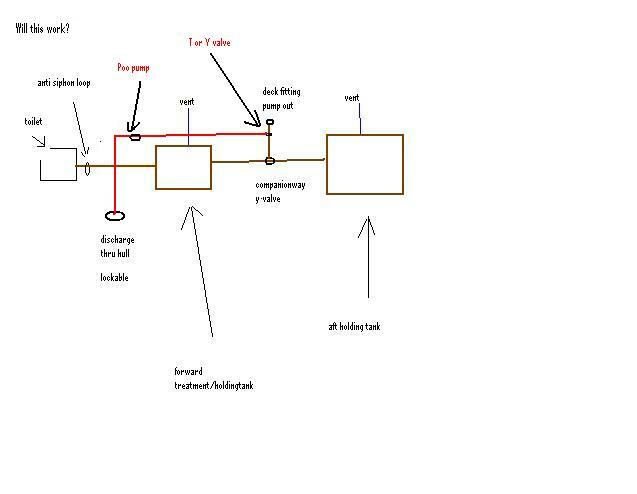 Here is a drawing I created a with what I think we have on the Bell. I need to make this work better so I am thinking of this as a solution. I will be adding waste PVC pipe on some of the runs and replace old hose. 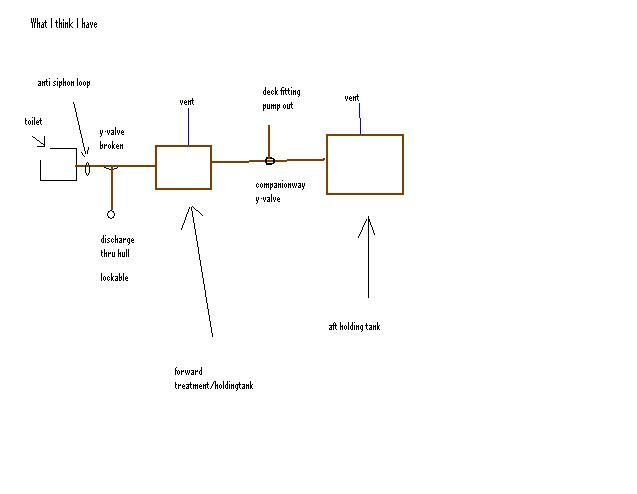 Or maybe this way would work better.. I have a thread on Cruisers and Sailing about this entire thing. You can view it by clicking here. This morning we are doing toilets. Ours does not function. 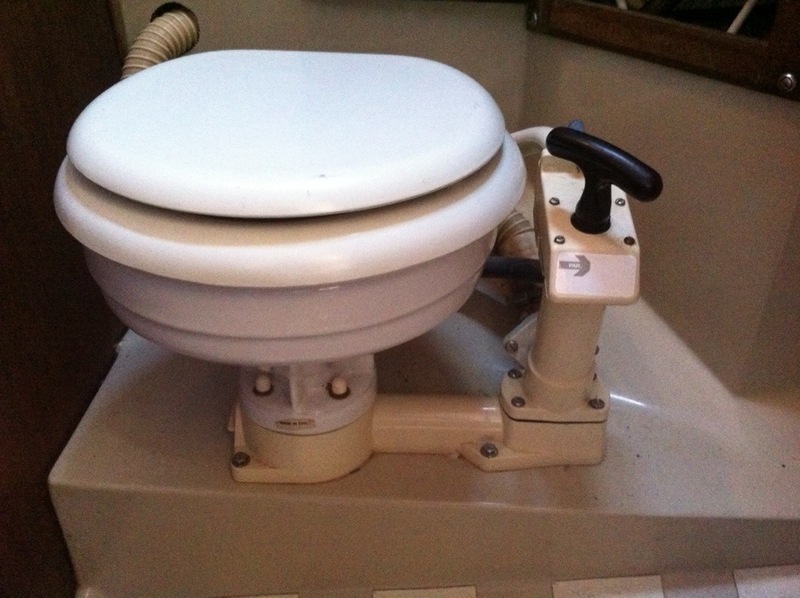 With a little help from the cruiser forum I have determined it is an old Jabsco marine toilet and have ordered a new hand pump. Of course after it leaves the pump it has to go somewhere. First place it goes it to this broken Y valve. From which it can go off the boat or to a holding tank. The holding tank can be pumped out from a deck fitting. I think once the Y valve is replaced we may be functional. I still have to research ho to discharge the tank over the side. First night on the new old boat. There is a full moon tonight, very pretty. Like a child on Christmas morning I can not sleep. Now that we are on the boat my mind is going a mile a minute. 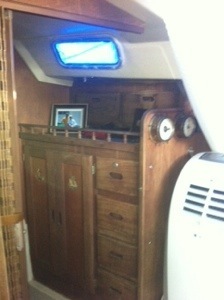 Lucky for us this new tub has a nice sized v berth forward, to which Lori retired a few hours ago. Chasing crumb crunchers about all day seems to wear her out. 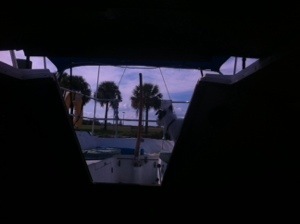 I have been spending the last few hours looking around the boat with a flashlight. Observing the electrical system and making notes in my head. Here are a few. The 12volt system is in need of a major rework. 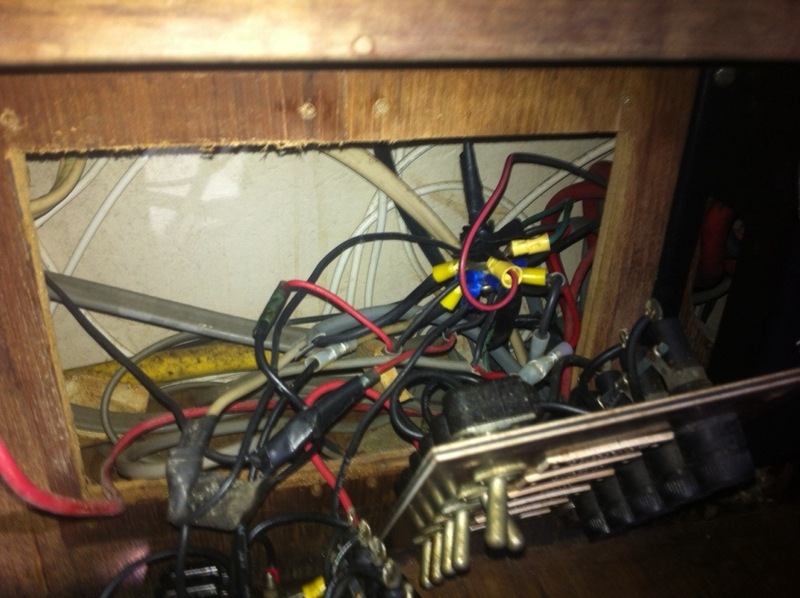 There are 2 A-B switches, both appear to be wired and I have no clew how they run. The factory charger is still installed. This would not be a big deal but for it sits on the bulkhead above one of the batteries, a battery that is not secured in a box and adrift. The charger is a big tin box (think 1978) that is 3 inches from shorting the battery terminals. Ugg. 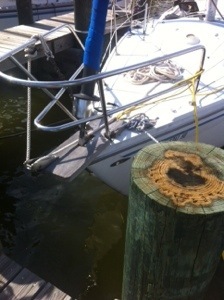 It appears not on wire has ever been removed from the boat. The three bulkhead gauges that do not work. 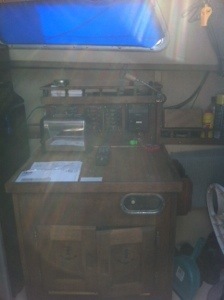 The non functioning spreader lights, the long since removed VHF radios. It is all still there. I see a rip out in my future. 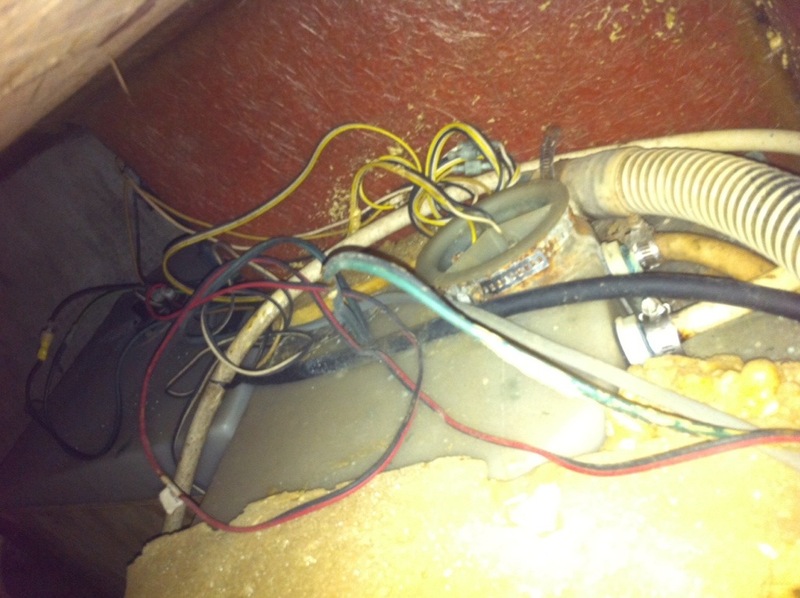 The bilge pump is not wired at all. 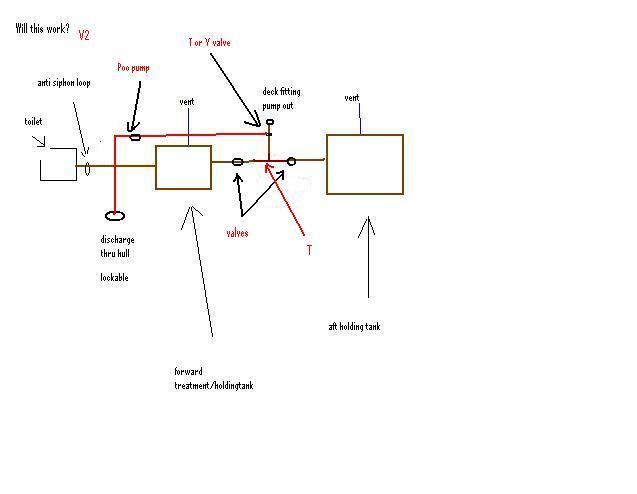 It is there along with a float switch. I need to fix that soon. I am surprised the anchor light at the masthead still works. It’s wire is frayed and spliced in the overhead. New wires to go up the mast. A good thing I noticed is that there is a really nice piece of rg8 going up the mast. Hopefully it can be salvaged for the VHF. 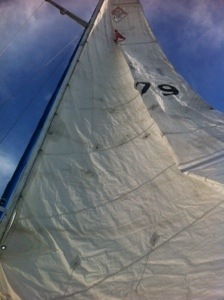 I will be talking to a rigger on Monday and setting up an appointment to pull the mast. The hope is when they drop it I can run new cable and instal an new VHF antenna, vine vane, LED anchor light, spreader lights, Pennant lines and an led steaming light. I also want to check the wind gauge that seems to be turning happily up there that I can find no wire for. The good thing is I can do everything but stepping the mast myself with only the cost of new connectors and some tinned wire. I think a lot of materials I can reuse. Well, it is late and time for bed. More later. I am sure I will find more. So we have gone and done it. We have dove into buying a bigger boat. Now we have a shower, dual sinks, sink in the head. Lots more room and a lot more boat. Her name will be “Lori Bell” home ported out of Sanford, Florida. The plan is to have her hauled for a bottom job, repaint the deck with nonskid and tune the standing rigging. She needs a new diesel so we will be keeping an eye out. 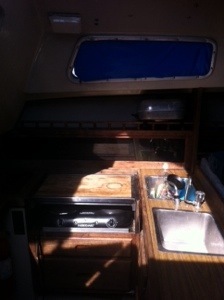 The clew will be up for sale in about a month, if anyone wants a nice Catalina 27 drop us a line. Looking never hurt, well actually. 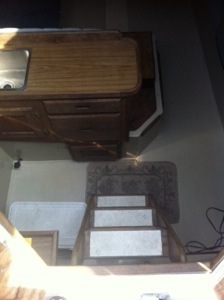 So Lori and I made the mistake this weekend of looking at our neighbors Catalina 30 that is for sale. We may be upgrading sooner than scheduled. 1. Sleeping on the Clew seems to be hard on my back. 2. Why fix the Clew up any more if we know we want a bigger boat going forward. 3. Inboard Diesel is better than an outboard. 4. Most important, it has a shower.